Free custom tshirt quotes is what we give out all day every day. We like to engage our clients and not just send out a robotic type response that is very cold and has a cold demeanor. We know most people don’t order custom t-shirts on a regular basis and many clients have never placed an order before. So we explain our pricing and often times when necessary we give you options. Sometimes people will inadvertently choose a very nice expensive shirt when they are looking for an inexpensive shirt. Sometimes they are looking for quality and choosing a low quality shirt. More often than not people will submit a design with a dozen print colors for a very small quantity of shirts. In these cases we explain the expense and provide options to keep the shirts cost effective. Free custom tshirt quotes are our pleasure and I think you’ll find our pricing is super competitive yet our customer service and order turn around time can’t be rivaled by any other local Saint Louis companies. Even on one and two shirt orders that we don’t provide we’ll let people know where they can find that service. We feel that while we aren’t going to get every job that gets presented to us, the least we can do is give everyone our time and who knows what the future holds. A person may only need one t-shirt today but next month they may need one hundred shirts. People always remember those who take the time out for them. We aim to be that company on jobs we don’t perform if nothing else, we are just a friendly honest family owned business. If you are interested in free custom tshirt quotes we make it easy to get one. On our website homepage you’ll see options to design online and an online quote form. If you use either of these tools you’ll get a quote sent over within an hour during the week and a few hours on the weekends as we are not open weekends. 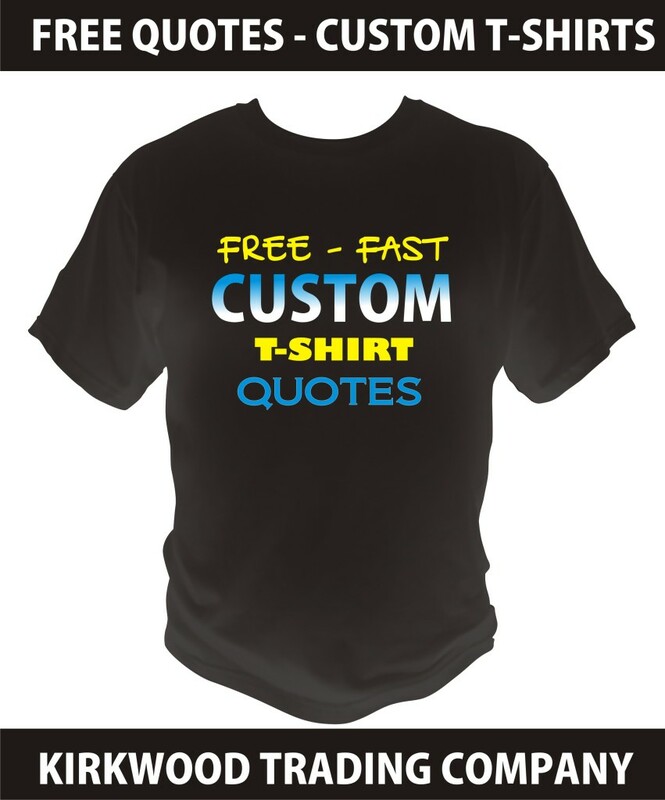 Free custom tshirt quotes are fast, easy, and convenient. We will explain the process and the pricing and make all of the pricing very simple to understand. Contact the Kirkwood Trading Company for any free custom tshirt quotes you may have and we’ll be happy to assist you.